Niccly figured raised-panel doors give any cabinet a sense of depth, an air of distinction, and a feel of superior craftsmanship. For years I made raised (also called fielded) panels for frame-and-panel doors the conventional way, from solid wood. That often means gluing up two or more boards and matching their grain patterns as best you can. It's often difficult to achieve a continuous grain pattern across a large panel, especially with figured wood. Then I came up with an easier way to make large raised panels with continuous grain, using veneered MDF (medium-density fiberboard) and solid wood edging. This method offers two important added benefits. The first is the stability of MDF— even the largest veneered panels are largely immune to the movement and warping that can afflict solid wood panels. Secondly, my technique gives you vastly greater design opportunities, since veneer is available in a wider variety of grain patterns and species than solid wood. For example, you can achieve multiple book-matches by using consecutive veneers over several panels. As shown in the drawing opposite, solid wood edging lets you cut a bevel and raise the field without exposing any of the MDF. On the outside the veneered panel looks and feels like solid wood. Inside it's mostly MDF, with a solid-wcxxi edging. Solid wood edges. Clue and clamp mitered edging to the MDF, using biscuits for good alignment. The author glues up two opposite edging pieces first, lets them dry; then glues up the other two. I'm not trying to fool anyone into chinking these panels are made of solid wood. The beveled edging won't match the field perfectly—especially on the rails, where the grain runs perpendicular to the panel. So you shouldn't use this technique in reproduction work where you're striving for authenticity. Otherwise it's a great way to make your panels quite stunning. The trick to building durable, warp-free doors is in the stock preparation. Use quartersawn wood wherever possible. Don't thickness-plane and rip the stock all at once, but sticker the wood for a few days to give it a chance to move (release the tension) between milling operations. I always make full-size drawings of the doors so there's little chance for mistakes. I make each door frame using in.-wide stock, which is wider than what you're accustomed to seeing. I think the extra width distinguishes my cabinets from the run-of-the-mill. If the door is to fit flush in the cabinet opening, I cut the frame's picccs to the exact size of the opening, then trim it to fit later. I proceed to build the frames. 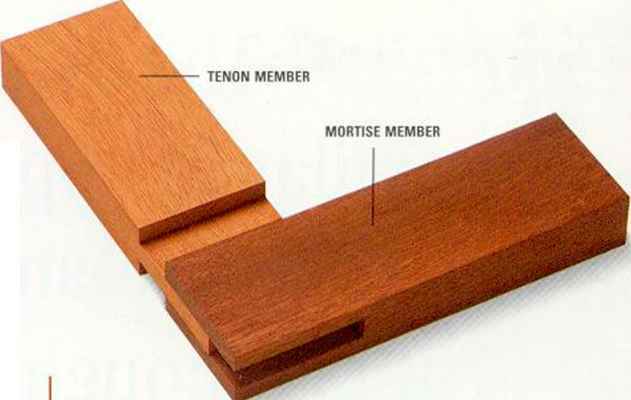 For cabinet doors that will be subject to a lot of use, use mortise-and-tenon joinery for strength. Or you can reinforce cope-and-stick joinery with loose tenons. Simple copc-and-stick joints will do for light-duty or fixed panels. 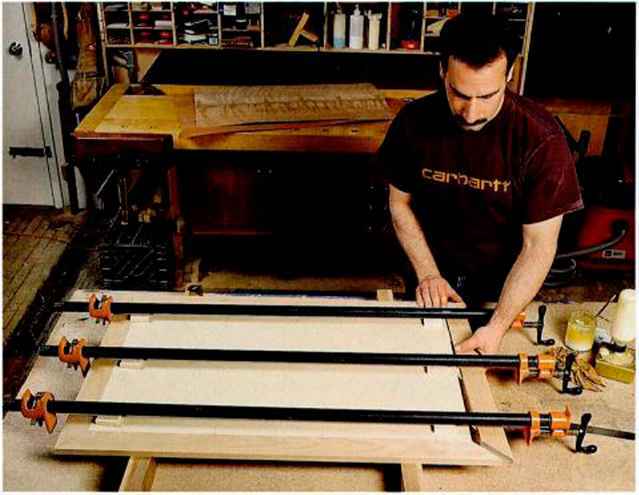 Dry-assemble the frames to measure the opening for the panels. The panels' overall size should be V2 in. larger in both length and width than the inside opening of the frame. This will allow V4 in. of the tongue to sit in the groove. Subtract 4 in. from this length and width, and you have the final s'\7x of the MDF panel (not including the edging). I've used MDF in thicknesses of VS, ^/g, and in. for door panels. Thicker panels will have a raised field that's proud of the frames, for a look of greater depth. Thinner panels, on the other hand, will be rcccsscd, making it easier to sand the frame joints flush and smooth. Cut the MDF to its final length and width now. For a traditional or understated look, use solid wood edging that's the same species as the front veneer. If your design sense is contemporary or bold, you can use a contrasting species for the edging. I prepare the edging stock as carefully as the door frame—it needs to be flat, straight, and the same thickness as the MDF. I rip it to 2V4 in. now (I'll trim it later to its final width of 2 in.). I glue the edging to the MDF panel with biscuits for alignment purposes. They're not really needed for strength, so space them fairly far apart—every 6 in. or so is fine. I miter the ends of the edging picccs so the corners meet at 45". Use a power miter saw for accuracy. Cutting these picccs to the right length takes care. To do it, miter one end of each edging piece.